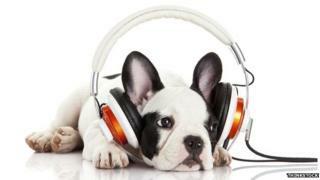 The researchers suggest that this might indicate that dogs, like humans, prefer to listen to a variety of music. They will now carry out experiments to see how dogs respond to different genres. The study was carried out by the Scottish SPCA and the University of Glasgow, and involved two groups of dogs being examined over a period of two weeks in a rescue and rehoming centre. One group of dogs was observed in silence, whilst the other had classical music played into their kennels. The conditions were then switched in the second week. In both groups the dogs' stress levels, measured through heart rates, saliva samples and observation of behaviour, decreased significantly after listening to music. The dogs also spent less time standing and barking when the music was being played. Male dogs seemed to respond better than female dogs. Scottish SPCA's education and research manager, Gilly Mendes Ferreira, said: "Although by the end of the week their heart rates and behaviour associated with kennel stress had returned to normal, the initial findings are very encouraging and show that classical music does have a positive impact on the dogs' welfare. "The average length of stay for a dog in our care can range from one to three weeks for small dogs and pedigrees, while larger breeds can remain with us up to six months and some breeds over a year. "We want to make each dog's time with us as comfortable as possible and this research is at the very forefront of animal welfare." The study has been published in the journal Physiology and Behaviour.